Here is one of the latest and greatest starter kits available: KR808D-1. This is a cartomizer kit that will allow you to vape practically all day long. In this particular kit, you get one rechargeable battery. 3.7v 180mAh or 3.7v 280mAh Manual or automatic. Along with the battery, there is one USB charger, and 3 cartomizers with varying levels of nicotine from no nicotine to high nicotine. 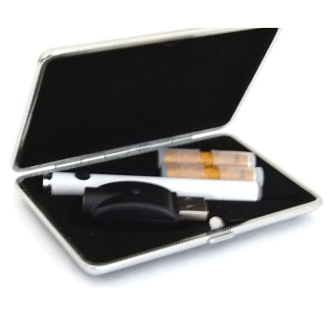 The cartomizers in the kit can be selected all tobacco flavor. All of the cartomizers are refillable with our e-liquid juice. Batteries are available in three color options: black, white, and silver.